Monty Python and the Holy Grail Blu-ray Review. There is no doubt that Monty Python cast a long shadow and if you’re interested in comedy at all (and if you’re not then you’re probably a very dour person who will find it hard to love and be loved) then it behooves you to go and buy this Blu-ray. My sister got bitten by a moose once, it was fairly serious. I thought I’d knew what to expect with the Holy Grail, but it’s been years since I’d seen and what I’d forgotten was how funny it was. Well most of it. The problem is that you’ve seen so much of it, so many times. The Black Knight sequence which has become such a classic suffers from the fact that it holds no surprise any more. Although “Come back here, I’ll bite your ankles off” does still raise a smile. 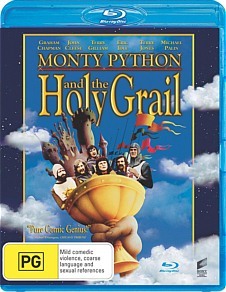 There is no doubt that Monty Python cast a long shadow and if you’re interested in comedy at all (and if you’re not then you’re probably a very dour person who will find it hard to love and be loved) then it behooves you to go and buy this Blu-ray. Audio: It’s suppose to be DTS-Master audio 5.1 but it seems a little thin to me. A good center channel though, means that you won’t miss any classic lines. Video: The video quality is variable, I have no doubt that this is better than the VHS release but it isn’t amazing, also the strange ratio that it was filmed in means that it’s not exactly widescreen it’s not exactly 4:3 but somewhere in between. Special Features: These are exactly the same as on the 2001 “Extraordinarily Deluxe Edition” DVD edition. There is a fairly good on location film from 1974 a good “Locations of the Holy Grail” with Michael Palin and Terry Jones. There’s the Brick Grail where you have scenes from the Holy Grail re-enacted by Lego, selected scenes in Japanese and not one but two commentaries. But even though this is nice it would have been even nicer to see perhaps a new documentary to justify the expense of buying this again.